Anyone who has eyebrow thinning from over plucking, alopecia, chemotherapy or asymmetry, athletes, allergies to makeup, unsteady motor skills, poor vision, service women, and women with little time who desire to look their best at all times. Basically everyone, female or male, young or mature can benefit from permanent makeup. Permanent makeup is long lasting, but will slowly fade over time and may require touch-ups to keep your look fresh and beautiful. Factors such as sun exposure and exfoliating products can shorten the lifetime of your permanent makeup color. It’s best to have touch-ups before the color fades considerably, thereby avoiding a completely new procedure. According to the Center for Disease Control, permanent makeup is safe. My client’s safety comes first! I strictly adhere to the standards established by the CDC. Needles and implements are sterile, disposable and one-time use only. Is there any discomfort or pain? Everyone’s pain tolerance and sensitivity varies. However, quality topical anesthetics are used to make your experience as comfortable as possible. Clients may describe a sensation of tweezing or stinging which subsides upon completion of the procedure. What if I don’t know the right color or shape that looks good on me? Your appointment will include your consult. At that time I will help you create your unique design based on your goals and desired look. Your permanent makeup will be tailored to look natural and compliment and blend with your skin tone and hair color. An analysis of your facial shape and features are noted and precise measurements are taken to assure symmetry. You can enhance your permanent makeup with your favorite cosmetics for an “evening look” and “special occasions”. Striving for a ” daytime look” allows you diversity. Your follow up appointment will be to fine tune your design and saturate the pigment to extend the life of your permanent makeup. What preparations do I have to make prior to my appointment? For best results, please ensure that the areas to be treated are cleaned and moistened and blemish free. Areas of “open skin” or infections are not treated until completely healed. If you normally wear makeup, you may wear it to your appointment. This will help to determine your personal makeup routine and style. If you are using any lash growth enhancement serums (for permanent eyeliner); you will need to discontinue their use 30 days prior to your permanent makeup procedure to avoid migration of the pigment under the skin. It is also best to avoid caffeine products prior to your Permanent Makeup treatment. Caffeine increases blood pressure and therefore increases bleeding. Being calm and relaxed during your procedure assures comfort and improves results. 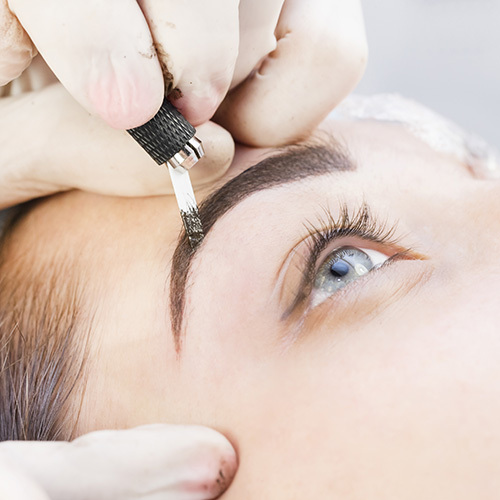 Eyebrows: Electrolysis, waxing, tweezing and dying of eyebrows should be done at least 48 hours prior to your procedure. 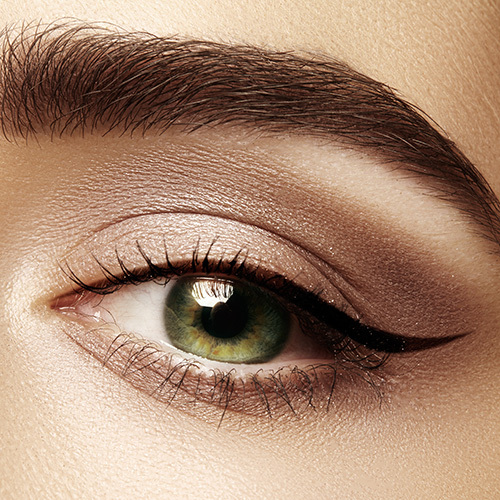 Eyeliner: Persons with glaucoma should consult with their Ophthalmologist to determine candidacy for permanent makeup. Lash serums (i.e.) Latisse, Revitalash & Rapid Lash) should be stopped at least one month prior to your procedure and complications should be discussed with your technician. It is recommended to discard old tubes of mascara to avoid possible infection. Contact lenses should not be worn to the procedure and normal wear can be resumed the following day. Lips: If you have had a history of cold sores, you must pre-medicate with an anti-viral medication. Ask your physician for a prescription for meds ( i.e.) Famvir, Zovirax, Valtrex and Acyclovir. You should exfoliate (scrub) your lips twice a day for three days prior to your appointment. Discontinue any lip plumping products three days prior to avoid increased blood flow that will result in a less than optimal result. You will need to reduce water exposure to your treated area. Therefore, no swimming or hot tubs for at least one week after your procedure and avoid scrubbing your permanent makeup until it is completely healed. Sun tanning is not recommended. To ensure safety, anyone pregnant or nursing must wait until this phase has past and hormones return to normal. Your permanent makeup will be darker and more vibrant for the first few days. There is no swelling or redness for eyebrows and 1-2 days of slight swelling for eyes and lip procedures. Avoid scheduling your permanent makeup procedure around social events. After the healing period 3-8 days, the area will appear softer and lighter. If I already have permanent makeup that I don’t like, can anything be done? Yes, Permanent makeup that has faded to pinkish or blue gray tones can be somewhat be “color corrected”. However, color that is extremely dark may have to be removed with lasers by a licensed professional before any reapplications. Color corrections are separate fees and make require 1-3 applications and are not included in your standard permanent makeup procedure pricing. Also, previously pigmented areas reside in the area needing to be treated and can sometimes take additional applications to achieve your desired look.There are no guarantees of results for any permanent makeup procedures as personal outcomes can not be determined. If the technician is unable to perform the permanent makeup application because of client intolerability, there will be a $75 set up fee. Can permanent makeup cover or camouflage scars or stretch marks? Unfortunately, no. Micro needling is much more beneficial in the areas of “white” scars and /or stretch marks. See my Micro Needling tab for more information or call me for a free consultation.